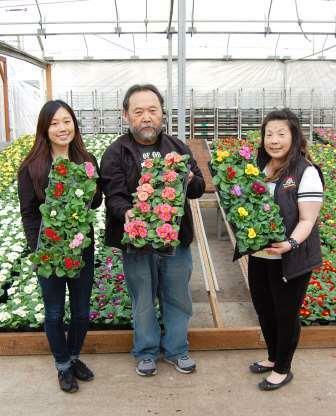 Iwasaki Bros., Inc. is a family-owned, wholesale bedding plant grower. Started in 1916 by B. Y. (Billy) Iwasaki as a small dairy farm in Hillsboro, Oregon, it changed in the 1920's to row crops - asparagus, blackberries, broccoli, brussel sprouts, bush beans, cauliflower, corn, strawberries, and tomatoes. Early each spring, Billy and his sons, George, Ike and Art, grew vegetable starts in a greenhouse of 1,250 square feet. 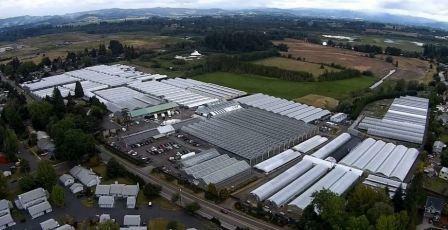 This gradually expanded to a year-round operation of 629,050 square feet of covered greenhouses, growing annual and perennial bedding plants as well as pre-planted planters and hanging baskets. 100 Years of Iwasaki Bros., Inc. In 1968, the family started hand-tying Christmas evergreens. Targeting the consumer, Iwasaki Bros. sold directly to fund raising groups from Florida to Hawaii but also to wholesale flower markets and retailers. The Christmas greenery, manufactured on site and distributed nationally, includes wreaths, door swags, candy canes and garlands. Today, Jim Iwasaki, the grandson of Billy, manages the operation, and in 1999, brought his daughters Theresa and Julie into the business. As a 4th generation family, the girls look forward to carrying on the tradition of excellence and leading the business into the future. © 2018 Iwasaki Bros., Inc., All rights reserved.